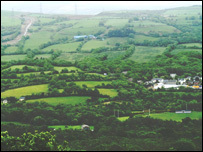 Villagers near Neath have met to plan a campaign to stop houses being built on fields near their homes. Organisers say more than 180 people turned up to oppose plans to develop land at Bryncoch Farm in Bryncoch. They say up to 200 homes could be built on a "green wedge" near the village and they are also worried about traffic. The land has been earmarked for houses on Neath Port Talbot Council's unitary development plan, but there will be a chance for objections to be heard. Gareth Mulligan, a member of the local action committee set up to co-ordinate the protest, said: "The land is what they call a green wedge - it's basically hay meadows that have not been intensively farmed for the last 50 or 60 years and have been protected up until now. "There are a number of badger setts and there's quite a significant natural wildlife pond. "We've got three main areas of objection. "First on environmental and ecological grounds, the second is that there are already problems with the sewerage system in the area and the third is that the roads are already at full capacity. "Over the next few week we will be formalising our objection report and our letter campaign," added Mr Mulligan. Each local authority in Wales has to have and regularly revise a unitary development plan (UDP) which governs where building can occur and where development is prohibited. When the council originally drafted the UDP in 2003, it proposed to build the houses at Leiros Park. A public inquiry was carried out after 600 objections to the plans, which resulted in the UDP being looked at by Welsh assembly planners. They proposed an amendment, recommending that the houses be built at Bryncoch Farm instead, which the council accepted at a meeting in March. However, there remains one window of opportunity for protesters to fight the amendment during the final public consultation later in the year.